Gluten free. Low saturated fat. Source of fibre. GMO free. Suitable for vegans. 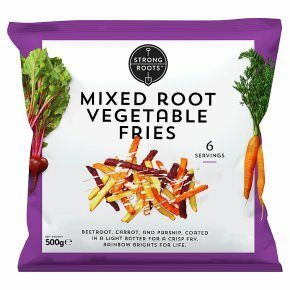 A vibrant selection of beetroot, carrot and parsnip coated in a light rice flour batter for a crisp fry. 1. Preheat the oven.2. Place the frozen product in a single layer on a baking sheet.3. During cooking, turn once.200°C Fan 180°C Gas Mark 6 20-25 MinutesCooking instructions guideline only.